Arthur Beecroft was a young, Cambridge-educated barrister, only 24 when war broke out in 1914. 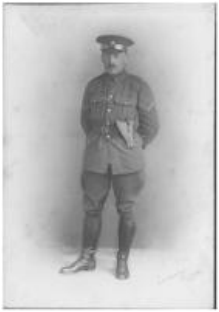 He was quick to join up and fight for his country, but after initial training he was dispatched to the East and found himself embroiled in the disastrous Gallipoli campaign (April 1915 to 1916). The campaign was an ill-conceived idea of Winston Churchill’s, championed by Kitchener and catastrophically pursued by the various generals appointed to carry it out. The idea was that the Allies would invade Turkey (via the Dardanelles), thereby opening up a second front against Germany. However, the invasion stalled on three beachheads almost immediately, due largely to shockingly bad leadership at most levels, and never achieved even its initial objectives. In all, over the eight months of fighting, it caused some half a million casualties on both sides (British, Australian, New Zealand, French and Turkish). 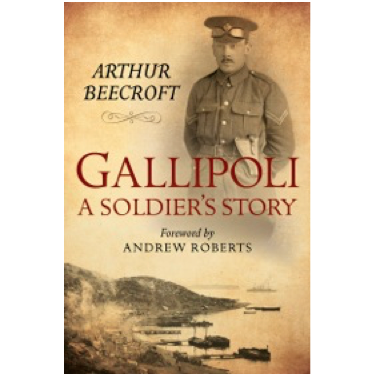 Afterwards, invalided out of the army and reflecting on his part in the Gallipoli campaign, Beecroft wrote a vivid, honest and affecting account for his son. It had lain undisturbed in an attic until recently when it was found by his grand-daughter Prue Sutton. The book includes extra historical background by Robin Hosie and a foreword by the eminent historian Andrew Roberts.